Madison, WI– The National League of Cities (NLC) and Children & Nature Network have selected Madison to participate in the Connecting Children to Nature Leadership Academy in Salt Lake City, Utah this October. The leadership academy will provide city officials with the skills and knowledge to take up new or expanded leadership roles in improving access to nature in their communities. 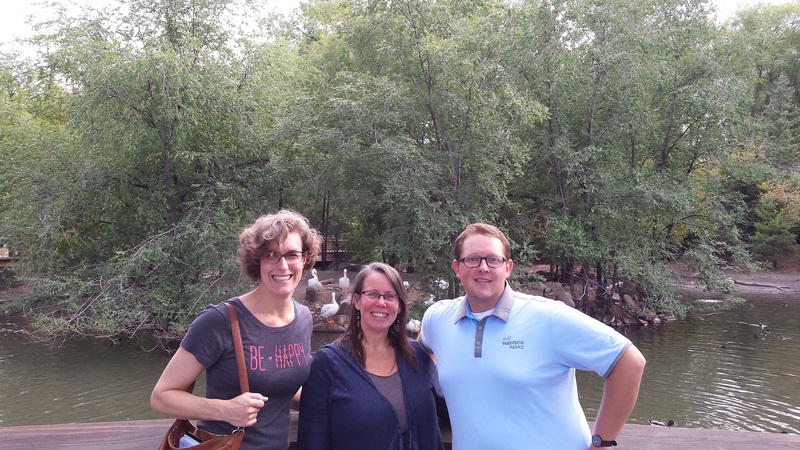 Mary Michaud with Public Health Madison & Dane County, Alder Rebecca Kemble, and City Parks Superintendent Eric Knepp visit the Tracy Aviary in Salt Lake City. Over the course of the two-day meeting, City of Madison Alder Rebecca Kemble, Madison Parks Superintendent Eric Knepp, and Public Health Madison & Dane County Policy Director Mary Michaud, will represent Madison. They will learn about promising practices and strategies for connecting children to nature. Participants will work with national experts, attend workshops, conduct field visits and engage in peer learning with city leaders from the seven other cities who have been selected for the leadership academy. Benefits for increasing young people’s access to nature include improved health outcomes, such as lower rates of childhood obesity, as well as stronger academic skills and increased opportunities for social and emotional learning. Following the leadership academy, Madison will receive an invitation to apply for planning and implementation grants to support the city’s programs and initiatives focused on connecting children to nature. Additionally, Madison will have the opportunity to join the new NLC Children and Nature Learning Network, which will provide ongoing opportunities for city leaders to learn and receive support from nationally recognized experts in the field and city peers. Next postNature is good for you. Article round-up!